Few U.S. refiners own finished product pipelines. CountryMark’s private pipeline begins at its refinery in Mt. Vernon and travels 238 miles northeast to Peru, Indiana. 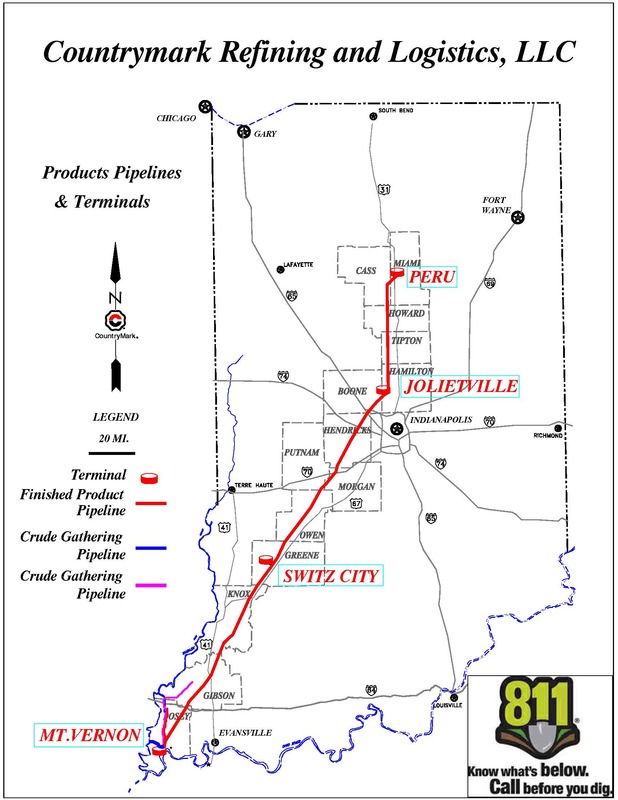 Four CountryMark terminals are strategically located along the pipeline in Mt. Vernon, Switz City, Jolietville and Peru, Indiana. State-of-the-art ethanol and biodiesel blending technology can be found at each CountryMark terminal. Here, CountryMark member companies have access to both proprietary and non-proprietary fuels. Non-members have access to non-proprietary fuels. From the terminal racks, fuels are trucked to retail fuel stations, end users and/or bulk fuel facilities.